Chances are, you know more about laser therapy than you realize. Light can cause changes in cells. For example, light from the sun stimulates your cells to produce melanin giving you a tan. Laser therapy uses a different type of light to stimulate cells. Multiradiance, the brand of laser we have chosen, uses four different types of light to optimize healing power. Can you do surgery with this laser? We have purchased a therapeutic laser. It is used only for healing, not for cutting. The different names can be confusing. Our laser can be referred to as a therapeutic laser, cold laser, low level laser, and low level light therapy and does not cut or hurt the skin. OSHA is the government organization that determines how safe things are. Our laser is a Class I, which is considered to be very safe. There is no risk of burning skin or feathers. While it is always a good idea to wear safety glasses, OSHA does not require it. Other veterinary lasers are available especially in Class IIIb and Class IV. We have chosen to utilize the safest laser class available. The compromise is that it takes a little bit more time to perform each treatment. One of the greatest benefits of a class I laser is that it is safe enough for an owner to use at home! Which ailments can be treated with laser therapy? At Pet's Choice, we have already seen some amazing results! Osteoarthritis, generalized pain, and wound healing seem to benefit the most. Approximately 85% of the animals treated at Pet's Choice have benefited from laser therapy. Tinkerbell initially presented for lameness in her front leg. Even after taking X-rays, we were unable to determine the cause of the lameness. Rest and time did not seem to be helping at all. 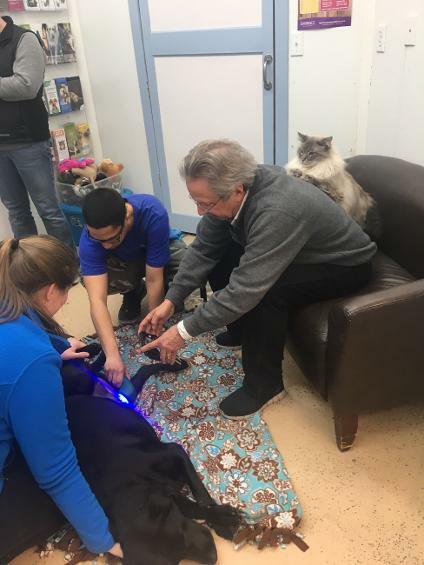 When we were testing the laser, Tinkerbell was one of the first patients we thought to call when we first got our new laser in. In less than a week, Tinkerbell's limp fully resolved and has not returned! In the video, we are doing the first step in her treatment called "unwind". It helps the patient relax, get used to the laser, and reduces pain by treating the nerves as they enter and exit the spinal cord. Brizo came to us for a routine spay. Six days after her surgery, when she should have been almost fully healed, her incision came apart. During the emergency surgery to stitch her back up, Dr.V could see how little healing had occurred. We decided to add in laser treatments to see if we could help her to heal. Mark Strong, traveled all the way to Alaska from Colorado to train us in how to use this amazing technology. In the photo on the left, he is teaching us how to use the blue light on Brizo to kill bacteria. Next, we used the other three wavelengths of light contained in the laser to encourage healing. We are happy to say that it worked! She rapidly healed after her second surgery thanks to our new therapeutic laser!! Tsiu is a typical crippled up, very old and much loved big dog. She had trouble getting around, dragged her back feet, and often paced around the house possibly due to pain and anxiety. 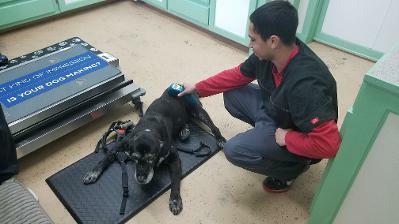 After two weeks of treatment, I received a text from the owner stating " Both my husband and I have noticed quite an improvement in Tsiu's mobility! She just walked up the steps from the back porch unassisted, but not unsupervised! She hasn't done that in a very long time!" Tsiu's treatment began twice daily for the first week, then dropped to once daily for the second week. 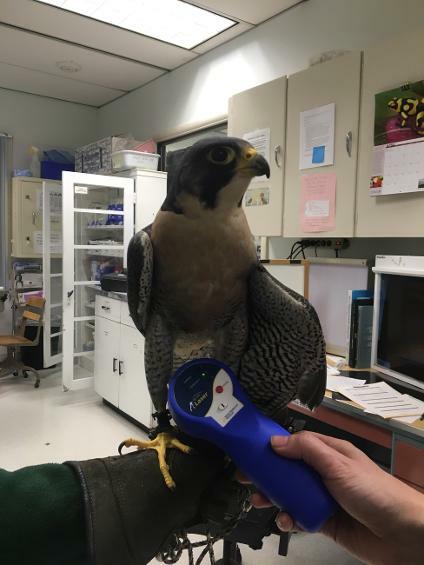 Our new laser is even being put to use at the Alaska Raptor Center! Pele, one of our resident birds, allows us to treat some scratches on his feet while calmly standing on the glove. You might have noticed that this laser looks a little different than the unit in the previous pictures. This is one of our rental units. It can be taken home for one week at a time. It saves the owner the effort of bringing their pet to the hospital, and allows for multiple treatments per day.